It's hard to believe that Dust and Dreams, the album that single-handedly revived Camel, was released so long ago. The subsequent 20th anniversary double-live CD elevated the band to their highest level in ten years, with the addition of ex-Fish sideman Mickey Simmonds on keys. Expectations were perhaps set too high for this new studio release, however. What we have here is basically Dust and Dreams the sequel. This time the storyline is about Irish immigrants, their hardships and toils. The music flows in a familiar fashion from start to finish, only adding drums and vocals when the energy picks up. But the vocal numbers are too much like the mid-80s Camel, with that Alan Parsons-like pop styling. The one exception, the closing instrumental suite, is what makes this disc worth owning for the Camel fan. On "Coming of Age / The Hour Candle," we are treated to classic Latimer soloing and the album's only real keyboard lead line. After that, it's almost 20 minutes of gentle waves (literally) in honor of Latimer's late father. Overall, the low energy level and depressing themes make this album a bit of a disappointment, but it's not without a few bright spots. 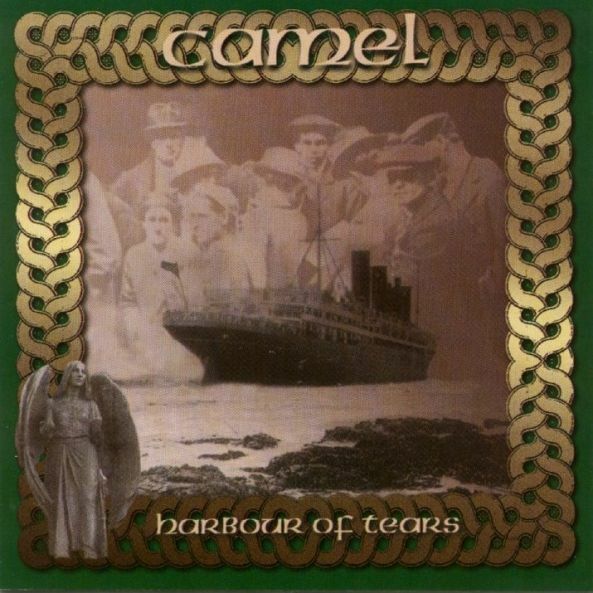 Camel's latest album is a rather moody, somewhat slow-moving concept surrounding the events which take place in a small town on the Irish coast. Harbour of Tears is again (like 1991's Dust and Dreams) much more of a solo, individualized project which seems to be the long term plan of Andy Latimer (Camel co-founder, guitarist, and songwriter) as the 'group' slowly churns out new material. Like the last studio Camel discs, this one grows on you after several (meaning greater than four) plays. It's pretty high quality work considering Andy put most of it together in a very small studio. Sorely missing is the keen band interplay which was the spotlight of the last live album and used to be the one of the high points of the band on which a fan could continually rely. Vocals have been supplied by old member, David Paton ( who also appeared on A Single Factor and the 10th anniversary tour CD).There is a distinct Celtic flavor which is the tone point of the album: which reminds me of some Clannad's later work. One of the better tracks is "Watching the Bobbins" with a blues base and including trademark guitar leads. Don't be intimidated by the last track, "The Hour Candle" even though there are quite a few minutes of surf sound at the end of the disk you can easily imagine a long stroll on the beach. For anyone hoping that Camel might be turning out something a bit more uptempo, full of fire and color, after the somewhat 'gray' Dust and Dreams, I hate to be the bringer of bad news. This latest studio release from Latimer and company is even more somber than its predecessor. That said, this concept album based on an immigrant's journey from Ireland to America covers plenty of new ground as well, mostly in its subtle use of tastefully applied Irish folk influences. The album's five vocal tracks (not counting the introductory and closing solo vocal by Mae McKenna) are separated by low-key symphonic instrumental interludes, none particularly memorable until we arrive at "Running from Paradise," which — interrupted only briefly by the final vocal track "End of the Day," segues into what is arguably the album's most powerful instrumental track "Coming of Age," a smoker that matches the best moments of the last half of Dust and Dreams, gobs of multi-tracked guitar and synths, and plenty of those soaring guitar leads that have long been Camel's trademark. The only problem is that the fire goes out too soon, the song is over and done in barely seven minutes. The closing instrumental "The Hour Candle" is another good one for its many great moments of solo guitar, though overall it's far less energetic, as it probably should be. After a little over six minutes, the music stops, we get a reprise of the solo vocal that opened the album, and then fifteen solid minutes of nearly inaudible waves at the seashore. How interesting! C'mon, at least make it a separate track so we can program it out. Like the last one, this has its bright spots, but overall leaves me longing for the Camel of yesteryear with a more positive sound.